BIBO is about great tasting water for everyone. Instant boiling, chilled, filtered water dispenser for homes + offices. 25% cheaper to run than a kettle! A new way to think about drinking water at home & at work. Get rid of your kettle, filter jug and bottled water. A beautiful countertop water dispenser that simply plumbs into your mains water supply so you never need to refill! A stylish water dispenser with multi-stage filtration that offers you instant hot and chilled drinking water at the touch of a button. 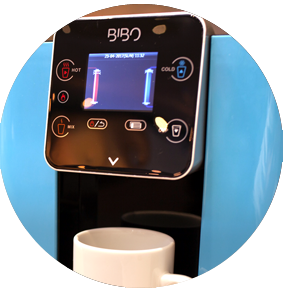 The BIBO water machine simply connects to your mains water supply and is easy to install. One of our friendly technicians can install it for you or you can choose to do it yourself. We give you all the info you need to look after and maintain your BIBO. The BIBO is super clever and will remind you when to change your filters and clean your hot tank.